Racist or religious abuse incidents recorded by police in England and Wales jumped 41% in the month after the UK voted to quit the EU, figures show. There were 3,886 such crimes logged in July 2015, rising to 5,468 in July this year, according to the Home Office. It said the sharp increase declined in August but has "remained at a higher level than prior to the EU referendum". Home Secretary Amber Rudd said the government was "determined to stamp it out". The number of hate crimes overall in the year 2015-16 was up 19% on the previous year. 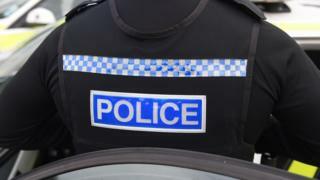 Latest figures show that 62,518 offences were recorded by police. Of these, 79% were motivated by race hate, 12% by sexual orientation, 7% by religion, 6% by disability and 1% were transgender hate crimes. Image caption The family said they were "scared to go out on the streets and speak Polish"
Ewa Banaszak and her family have lived in Plymouth for nine years, "this is our home, where we live and work" she said. The Polish natives had their shed deliberately set alight in July in a racially-motivated attack. Since the EU referendum, she said racist comments towards her and relatives had "intensified" and the family had received a "hate-filled letter" containing threats. Despite being told to "go back to your own country", Ms Banaszak said they will not go back to Poland. Standing at a bus stop, Brazilian-born Danilo Venticinque, 30, was talking to his Mexican wife in Spanish and a woman asked "you speak English, don't you?" "Can you understand what I'm saying? This is our country. We are leaving the EU. We will stop having so many people like you over here." He said people like the woman who approached him are "a minority". Liberal Democrat home affairs spokesperson Alistair Carmichael said the rise in hate crimes was "down to the nasty, divisive European referendum campaign that pulled apart communities, families and neighbours". He claimed that the government has treated the post referendum landscape in "the same divisive way". The National Police Chiefs' Council's (NPCC) lead on hate crime, Assistant Chief Constable Mark Hamilton said: "Numbers of hate crime incidents have fallen from the spike seen after the EU referendum but we still believe that many hate crimes are still not reported to us. "We are determined to play our part in addressing hate crimes in our society, supported by government and third sector partners". These figures confirm what previous data from the National Police Chiefs Council suggested - that there was a spike in hate crime after the 23 June poll. Part of the increase is undoubtedly due to a greater willingness by the public to report offences and better police methods for logging hate crimes. But strong anecdotal evidence supports the view that there was also a genuine rise in crimes targeted at ethnic minorities and foreign nationals: the Brexit vote appeared to unleash something in people - they felt they had a licence to attack Polish migrants and insult Muslims. Separately, one of the most striking features of the annual figures is a 44% rise in hate crimes directed at people with disabilities; the numbers have doubled in four years. Following the EU referendum, then-Prime Minister David Cameron condemned "despicable" incidents of hate crime. In July, the government published a hate crime action plan, which Ms Rudd said "sets out how we are further reducing hate crime, increasing reporting and improving support for victims". She added: "Our hate crime laws are among the best in the world, but we cannot be complacent." Assistant Chief Constable Hamilton said the NPCC was encouraged by the improved police reporting and support systems that had been put in place. According to the Home Office, over the last year police forces have made efforts to improve their recording of crime statistics, especially for violence against person offences. It said the improved records are "likely to be a factor" in the increase in hate crimes recorded by the police this year.